Figure 1. Don Page, a young man wearing glasses, sits at a vertical loom, weaving. The picture is taken through the warp threads of the loom. Black Mountain College was an experimental liberal arts college in Western North Carolina, active from 1933-1957. One of its students was Don Page, who went on to become an architect, graphic and interior designer, and artist. The Western Regional Archives (WRA) has a collection (PC.1924) of his drawing studies and textile designs from his time at Black Mountain College, 1936-1942. These drawings are done in mixed media, mostly on paper (with a couple on wood) and were stored in folders organized by genre, but needed new housing to stabilize them. Because many of the materials used to make the drawings are friable—pencil, ink, charcoal, pastels, and other similar media—placing many drawings together without interleaving had led to smudging and media wearing off onto adjacent drawings. Figure 2. A collage of six images of varying sizes and genres from the collection. Three are studies of violins, two are flowers, and one is an abstract color study on wood. that allows for the pressure of the cover of the mat, and anything that might rest on top of the mat, to rest on the material of the mat and rather than on the items themselves. It also allows for storing multiple items or thicker works than a traditional window mat. Because many of these drawings were made with friable media like charcoal and pencil, it was important to make sure that they wouldn’t wear on each other any more than they already had. We chose to use PhotoTex paper as interleaving between each drawing. PhotoTex is designed to be ultra-smooth to not abrade photographic materials, textiles, and works on paper. Its smoothness means there’s little friction for it to pick up friable media. We constructed the mats out of archival quality corrugated cardboard, making hinges on two sides so the drawings could be removed easily, and making a cover out of heavyweight cardstock. This was hinged to the mat with linen tape. While the mat base and cover were cut to a standard size, each mat is custom-fit to the drawings within (you can see the differences in the sizes of the drawings in the images below!). Figure 4. Two completed sink mats of the same size are placed next to each other. One holds a small set of drawings (about 9 inches by 12 inches) and the other a large set (about 19 by 23 inches), demonstrating how mats are custom built to different drawings. The completed mats—with interleaved drawings inside—are put in boxes for convenience and additional protection. Forty-eight sink mats were made for about 220 items. Figure 5. Five boxes are stacked on a table. The top box’s lid is removed, so the contents (the completed sink mats) are visible. A ruler is included for scale: the boxes are 25 inches by 32 inches. The WRA finding aid for the Don Page Collection is here. If you want to learn more about Black Mountain College, check out the NCPedia article, the NC Archives Digital Black Mountain College Collection, and the WRA finding aids of the Black Mountain College collections. This entry was posted in News, Western Regional Archives and tagged art, Black Mountain College, Collections Management Branch, Collections Services Section, conservation, Western Regional Archives on June 22, 2018 by Ashley. Black Mountain College operated from 1933 to 1957 in Black Mountain, N.C. and attracted leading artists, both in in this country and abroad, to their faculty including painter Robert Rauschenberg, composer John Cage, choreographer and dancer Merce Cunningham, sculptor Ruth Asawa, architect Buckminster Fuller, and artists Joseph and Anni Albers. This entry was posted in News, Western Regional Archives and tagged Black Mountain College, Special Collections, treasures on June 6, 2018 by avgabriel2. Erwin Straus at Black Mountain College. BMC Research Project. Series VII (Visual Materials). Box 91. Folder:North Carolina Division of Archives and History – Straus, Erwin. Erwin Straus, a German-American philosopher and psychologist, taught at Black Mountain College from 1938 through 1945. A German refugee fleeing from the growing anti-Semitism promulgated through Hitler’s rise to power, Erwin Straus and his wife, Gertrud (who also taught at Black Mountain College) were part of the growing population of refugee faculty. A faculty meeting at Black Mountain College. From left to right: Robert Wunsch, Josef Albers, Heinrich Jalowetz, Theodore Dreier, Erwin Straus, unknown, Lawrence Kocher. Black Mountain College Records. Photographs. Folder 83.1. With an emphasis in phenomenology (philosophical study of experience and consciousness) and neurology, Straus taught such courses as, “The Psychology of the Human World” and “Nicomachean Ethics.” Erwin Straus was considered to be a serious teacher, a seeming rarity at Black Mountain College where professors were often known by their first or nicknames. He was described by one student as, “… serious, humorless and on the extreme conservative side.” Despite the somewhat reserved views held about him by the student population, he was influential in pioneering a holistic approach to medicine, treating the mind and body as a whole rather than just the individual symptoms. Author of numerous books and articles, Straus’ works includes Language and Language Disturbances and On Obsession: A Clinical and Methodological Study. 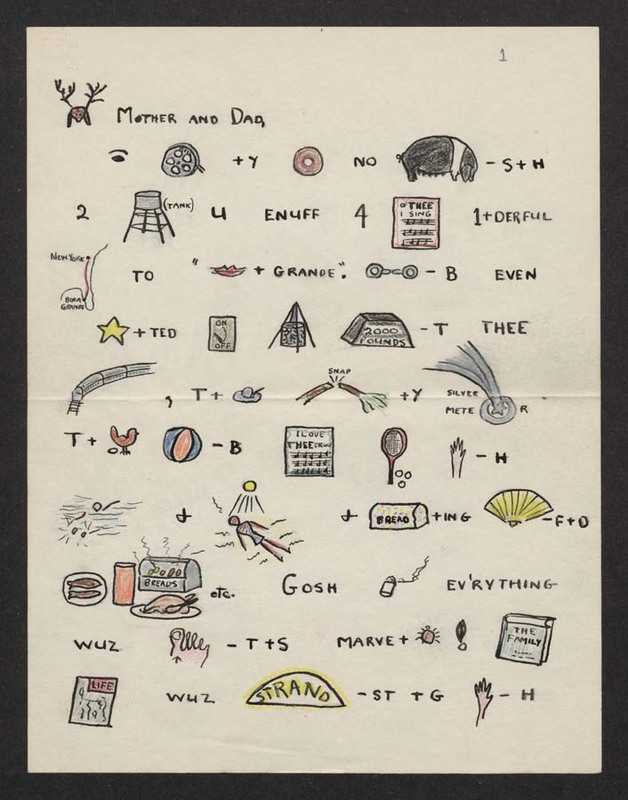 This entry was posted in Digital Collections, News, Western Regional Archives and tagged Black Mountain College, Western Regional Archives on August 11, 2016 by kevin. Black Mountain College operated from 1933 to 1957 in Black Mountain, N.C. and attracted leading artists, both in this country and abroad, to their faculty including painter Robert Rauschenberg, composer John Cage, choreographer and dancer Merce Cunningham, sculptor Ruth Asawa, architect Buckminster Fuller, and artists Joseph and Anni Albers. This entry was posted in Events, News, Western Regional Archives and tagged Black Mountain College, exhibits, North Carolina Museum of History, Treasures of Carolina, Western Regional Archives on October 9, 2015 by Ashley. 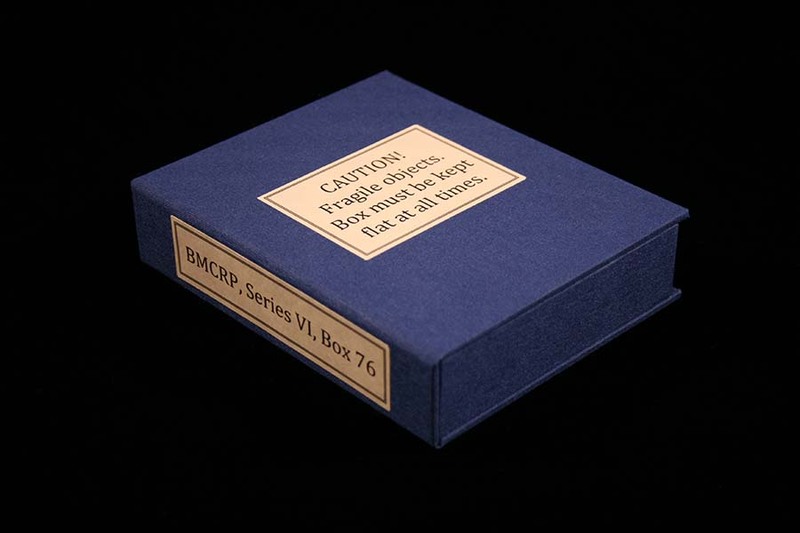 New housing for the David Tudor concert programs, BMCRP Series VI Box 76. Click the image to see a larger view. David Tudor (1926-1996) was a pianist and composer of experimental electronic music. He was an instructor and pianist-in-residence at Black Mountain College during the summer sessions from 1951-1953. On July 4, 1953 David Tudor gave a concert at Black Mountain College with programs printed on cigarette papers by BMC Print Shop. The State Archives of North Carolina holds two of these programs at the Western Regional Archives, one printed horizontally in red and one printed vertically in blue. These programs are in their original rolled cigarette form and remain filled with tobacco. H-frame during construction for the David Tudor concert programs. Click the image to see a larger view. David Tudor concert programs, BMCRP Series VI Box 76. Click the image to see a larger view. The concert programs needed a new housing which would better protect the fragile objects. A support structure was created for them by cutting an “H” shape out of several layers of museum quality mat board. 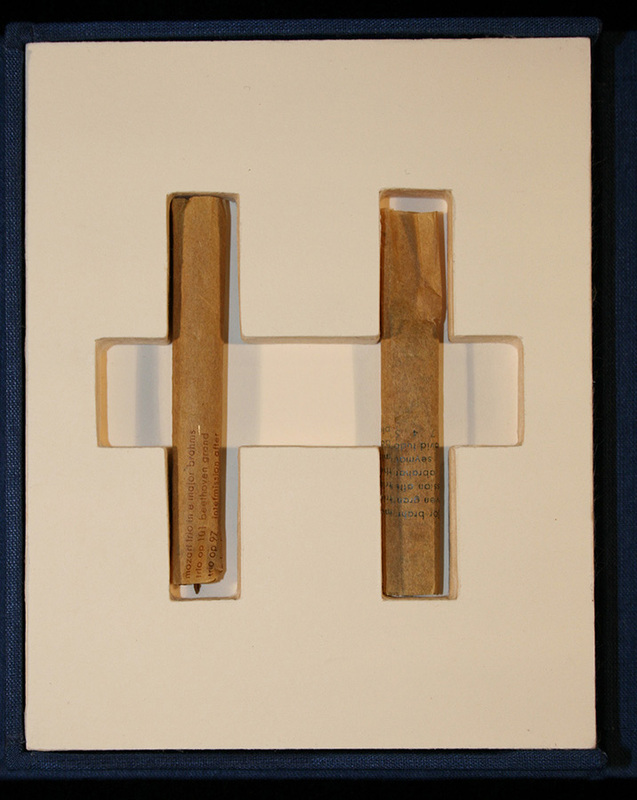 The legs of the H hold the cigarettes in place while the cross of the H allows for easier handling if they ever need removing from the housing. After adhering multiple layers of mat board together, the frame is thick enough to protect the programs from pressure coming from above. The cut edges of the H were lined with Japanese tissue to help smooth the transition between the layers. 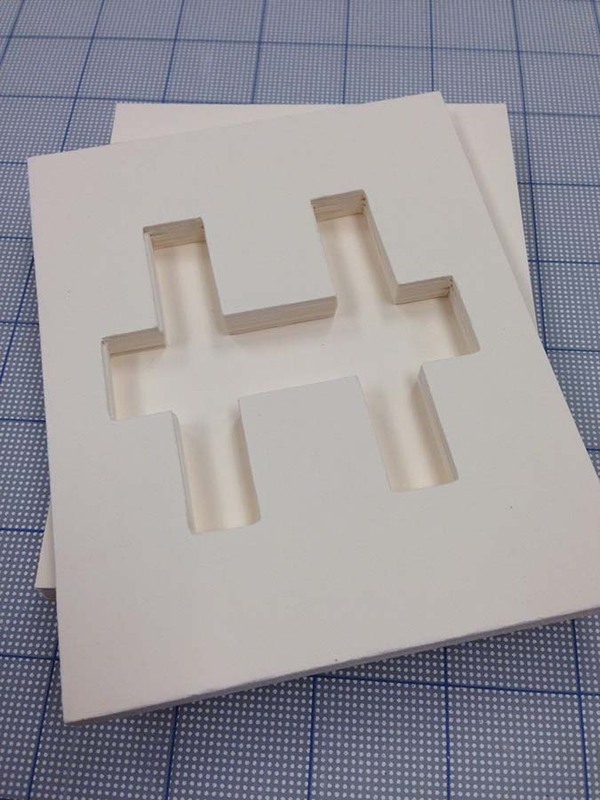 The H frame was adhered to several more pieces of mat board to form a backing layer. 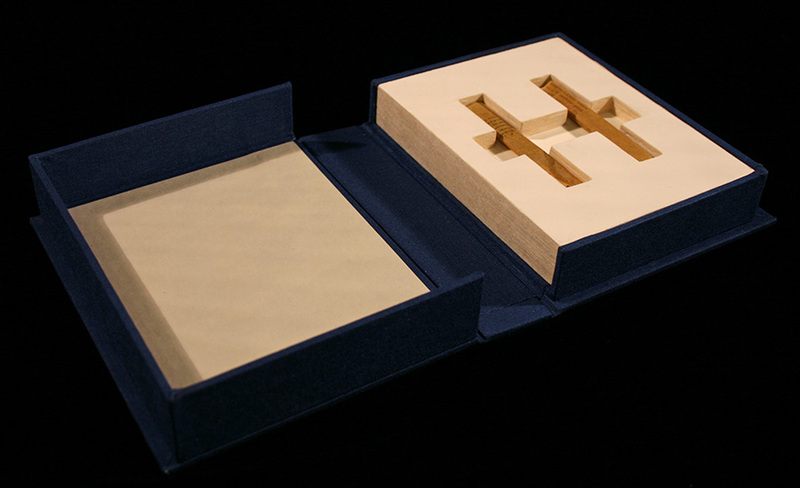 The completed frame was inserted into a custom cloth covered clamshell box which will provide additional protection. A view of the new housing for the David Tudor concert programs, BMCRP Series VI Box 76. Click the image to see a larger view. A closer look at the programs is available through the NC Digital Collections. This entry was posted in News, State Agency Records, Western Regional Archives and tagged Black Mountain College, Collections Management Branch, Collections Services Section, conservation, music, Western Regional Archives on September 15, 2014 by Ashley. Our collections are used daily by all sorts of researchers. Scholars, genealogists, historians and documentarians visit us on a regular basis and while we help all with their exploration into the past, it is rare that the archives (or archivist) plays a feature role in the project we assist on. That’s what makes the new Danu Collaborative Fully Awake project so unique and exciting for the Western Regional Archives. Fully Awake: Black Mountain College is a documentary film created nearly a decade ago by Cathryn Davis Zommer and Neeley Dawson. Through archival research, photographic history, interviews with former Black Mountain College students, teachers, artists and historians, the film gives a glimpse into the progressive liberal arts school hidden in the mountains of Western North Carolina. “Black Mountain College (1933-1957) was an influential experiment in education that inspired and shaped twentieth century American art.” It was a special place that inspired all who experienced it, so much so, that the long-term impact is still being studied today by scholars and artists from across the country and literally around the world. Cathryn and Neeley research acting for part of their project. Cameraman Dan said he loved filming at the WRA. While there are many BMC projects using the collections at the WRA for research, only the Fully Awake project has collaborated with the archives and integrated the archival collections as part of their endeavors. Thanks to new collections coming to light and advances in technology, Cathryn and Neeley are embarking on a new project to take Fully Awake further. There are several goals of this new ten-year anniversary re-imagining of the film. Not only will they be telling more of the story in more clear and profound ways, the most thrilling element for the WRA is that they plan on digitizing over 100 hours of original interview footage to be donated to the archives for permanent public use! 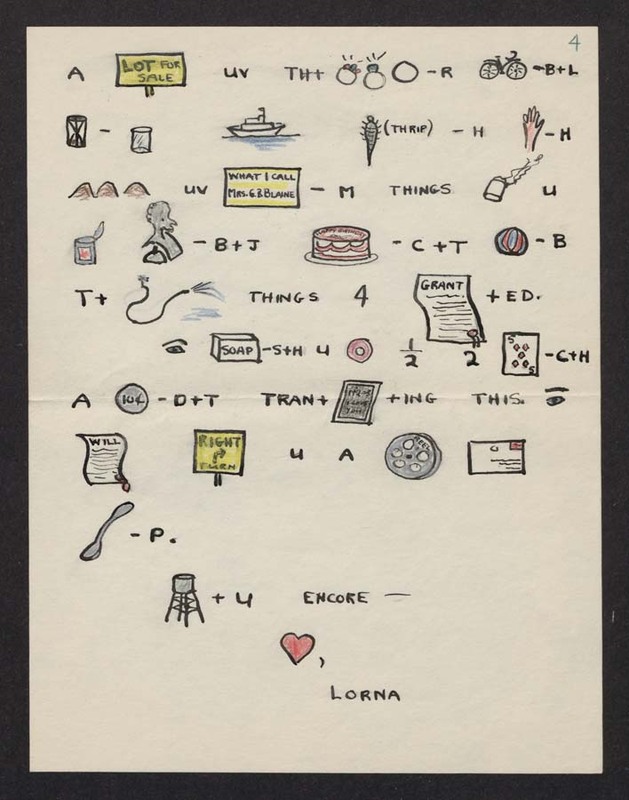 This entry was posted in News, Special Collections, Western Regional Archives and tagged Black Mountain College, Western Regional Archives on March 18, 2014 by Western Regional Archives.